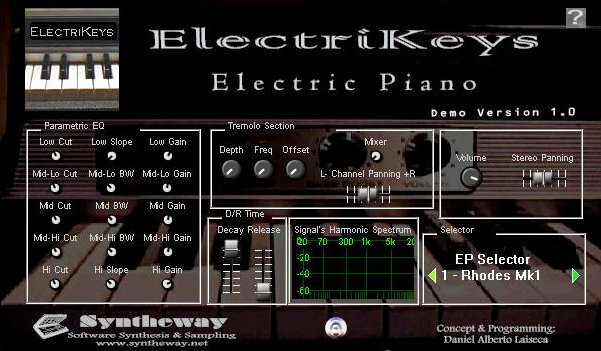 Syntheway has released ElectriKeys, an electric piano VSTi plugin. Sound is generated via a hybrid method that combines synthesis and sampling techniques, to create the most realistic sounds of these vintage electric pianos. Tremolo Section: Recreates the classic effect (which was called vibrato on the real Rhodes™ front panel). 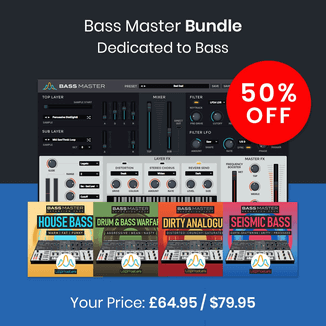 Contains a LFO (Low Frequency Oscillator) with modulation depth, frequency and offset. The panning slider controls the output effect distribution between left and right speaker and to help create a broad spectrum of stereo tremolo effects. 5-Band Parametric Equalizer: EQ composed of five parametric filters with Frequency, Bandwidth and Gain knobs. Equalization allows you to lower or raise the volume of specific frequency ranges for bass and treble manipulation. Also contains global gain wheel to adjust the overall volume (Turn the wheel to right to boost a band, or to left to decrease its level). Decay & Release Time: Decay sets the note decay while the key is pressed. Release sets the release (fade out) time after the key is released, offering unique tone to each player. 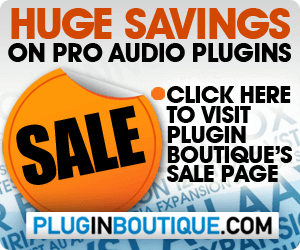 32 presets for Tremolo effects and Parametric EQ ready to play. Creating new sounds is as simple as combining these presets in different ways and tweaking any associated parameters from there as desired. FULL MIDI Automation: Every parameter can be controlled via MIDI or host automation. Visit Syntheway for more information.